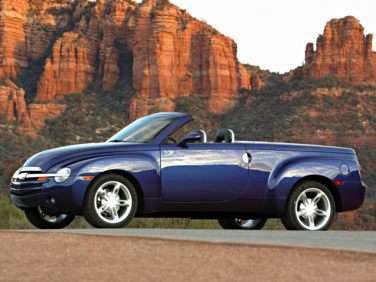 The Chevrolet SSR convertible pickup is a very distinctive, hard to miss and even harder to ignore looking vehicle. The SSR name actually stands for Chevrolet Super Sport Roadster. The vehicle is based on the SSR concept car that was first viewed by the public in 2000 at the Detroit Auto Show. The model debuted in 2003 and ran for only three years before being discontinued in 2006. One generation was produced over this time. As a showstopper, the SSR did its job well but in the current economic crunch and the need for all automakers to cut costs, the SSR hit the end. One of the early models became the pace car for the 2003 Indianapolis 500 auto race. It looks to be a cross between a convertible sports car and a old style truck. However, this vehicle is not a workhorse in any way. The vehicle offers two seats in the front, only a narrow box and no towing capacity to speak of. This retro-looking body sits atop the same frame as the long-wheelbase Chevrolet TrailBlazer. The EPA fuel economy rating for the 2005 Chevrolet SSR Pickup is 14 mpg in the city and 18 mpg on the highway. Part of the odd look to the SSR was the high wheels in the back. The front wheels were 19-inch but the rear wheels were 20-inch. The hardtop stowed vertically in the space between the seats and the rear bed – making it a hardtop convertible truck. If a consumer is looking to make a statement this vehicle could be it – a bit expensive but individualistic head turner. The vehicle was only mildly popular with sales running in the mid-twenties. This means that for anyone interested in a used Chevrolet SSR, finding one could be a problem. As far as handling and driveabilty goes, the Chevrolet SSR was easy to drive, although not the most comfortable, yet it wasn’t bad and for power with the bigger engine helped to boost the heavy vehicle’s performance. With the SUV platform, the SSR offered a higher seating position than many vehicles offering the driver better viewing. This same platform produced a more truck-like ride than the a car-like ride. The interior of the Chevrolet SSR follows the same retro touches as the outside. There is an oversized steering wheel, vintage fonts on the dials and the chrome covered six speed short throw shifter. The bucket seats have back support making them comfortable on long trips. The SSR was available in only one trim with many standard features included. For the convertible hardtop model, there is a power-operated hardtop system, leather seats, leather covered multi-function steering wheel with tilt adjustment, Tachometer, keyless entry and cruise control as well as a full complement of power accessories. ***** Standalone options include heated seats, auto-dimming mirrors and a premium audio system. Other add-ons included color-keyed bed strips and chrome trim on the interior. There is a rigid tonneau cover on the cargo bed. The Chevrolet SSR comes with many safety features. There are front and side airbags along with traction control, antilock brakes, four-wheel ABS, Child Seat Lower Anchorage, Electronic brake distribution Electronic traction control via ABS, Immobilizer, Rear limited slip differentialan energy management feature, trunk release, daytime running lights, pretensioner, integrated safety belt and an on and off switch for the airbag. Only stability control is not available either as standard equipment or as an option. There are no results available for the vehicle in the Government crash tests. Research shows the vehicle was never tested for frontal and side impact crash tests.